Captain Timothy L. Overturf, a native of Ottumwa, IA, graduated from Lawrence Technological University with a B. S. in humanities in 1985. The same year he completed his Master of Divinity from Detroit Baptist Theological Seminary. He also received the Master of Sacred Theology from Dallas Theological Seminary in 1989. In January 1988, Trinity Fellowship, a Plymouth Brethren Church in Dallas, TX, commended him to the military chaplaincy. He was appointed as a chaplain and entered Naval Chaplain School in February 1988. 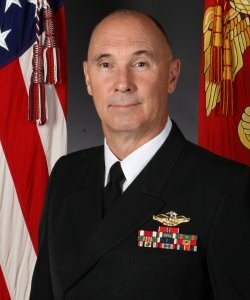 Chaplain Overturf’s first active duty assignment in April 1988 was with Commander Destroyer Squadron THREE TWO in Norfolk, VA. His service with COMDESRON 32 included a Mediterranean deployment and UNITAS 31, a cruise that conducted joint exercises with several South American naval forces. His next tour from December 1990 to September 1993 was as a Staff Chaplain at Naval Air Station Jacksonville, FL. From 1993-1996 he served as Battalion Chaplain with Combat Assault Battalion and as Regimental Chaplain for Fourth Marines, both in Okinawa, Japan. In December 1996 Chaplain Overturf reported to Naval Training Center Great Lakes, IL. During this tour he served as Staff Chaplain with Service School Command and as Chapel Pastor at Forrestal Village Chapel. Following NTC Great Lakes he reported in December 1999 as Command Chaplain aboard USS FRANK CABLE (AS 40), a forward-deployed submarine tender homeported in Guam with a follow-on shore tour on the island. Upon his return from Guam in 2003, Chaplain Overturf and his family moved to San Diego where he reported aboard USS John Stennis, one of the Navy’s newest aircraft carriers. Chaplain Overturf’s personal awards include the Meritorious Service Medal, the Navy and Marine Corps Commendation Medal with two gold stars and the Navy and Marine Corps Achievement Medal with one gold star. He was the Navy Chaplain recipient of the Military Chaplains Association Distinguished Service Award for 2001. He is married to the former Ann Young of Ottumwa, IA. They have eight children, ages three to nineteen.